As we look towards International Women’s Day and the forthcoming national and local elections, it seemed a timely moment to revisit the Library’s wonderful, but surprisingly little-used, collection of election literature for evidence of the first women elected to the City Council. Although limited parliamentary suffrage was not granted to women until 1918, they had been able to vote and stand for election in local political contests for some time as members of School Boards, Poor Law Guardians and local councillors. Birmingham Municipal Elections Literature, 1909 – 1911. 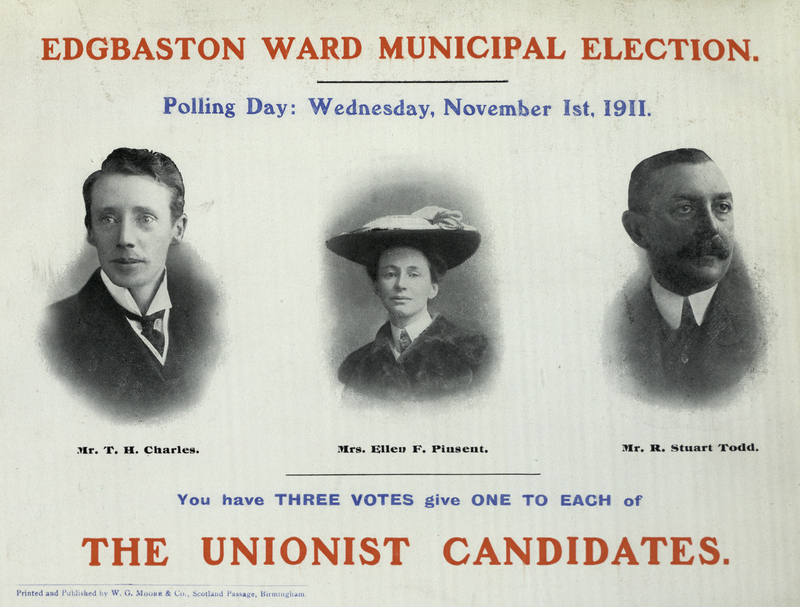 Municipal Election 1911, Edgbaston Ward, Mrs Ellen F Pinsent and two other Unionist Candidates. In 1911 two women were elected to serve on Birmingham City Council for the first time. Before this, a few women had served on City Council committees as co-opted, unelected members, particularly committees concerned with education, and the health and welfare of women and children. This had been the case with the first elected female councillor Ellen Pinsent, also known as Mrs Hume Pinsent and later Dame Ellen. Elected as a Liberal Unionist for the Edgbaston Ward on 1 November 1911 she had previously served for some years as a co-opted member of the Education Committee and Chairman of the Special School Sub-Committee. Well known nationally for her work with children who had special educational needs (or in the parlance of the time ‘feeble-minded’), she had served on the national Royal Commission on the Care and Control of the Feeble-Minded from 1904 to 1908. Her stint as an elected councillor was cut short in October 1913 when she was appointed as an unpaid Commissioner for the Board of Control. Ellen was rapidly followed by Margaret Frances Pugh, elected in North Erdington on 22 November 1911 and nominated by the Birmingham Women’s Local Government Association who campaigned for the election of women to local councils. Educated at King Edward’s High School for Girls, Margaret was a keen supporter of women’s suffrage and a teacher in an adult education school for women. Defeated at her first attempt by 59 votes she stood again when the successful candidate was made an alderman and this time, in the words of the Women Workers magazine, ‘was returned by the triumphant majority of 790.’ As a result two of Birmingham City Council’s 120 elected councillors were women, with a further eight serving as co-opted members of committees. Like Ellen, Margaret served only a short time as a councillor, resigning her seat in November 1913. The third woman elected however spent over 19 years on the Council. Clara Martineau represented Edgbaston from 14 October 1913 until her death in 1932 at the age of 57. Like Ellen she benefitted from family connections among the City’s elite families. For the daughter of former Mayor Sir Thomas Martineau, sister of wartime Lord Mayor Ernest Martineau, and niece of Alderman Sir George Kenrick, civic service was a family tradition. Like all the early women councillors, Clara had a long track record of working in philanthropic and social causes in the city, including the Women’s Settlement and the Charity Organisation Society, and had served as a co-opted committee member before being finally elected in her own right. Birmingham Municipal Elections Literature, 1920 – 1924. 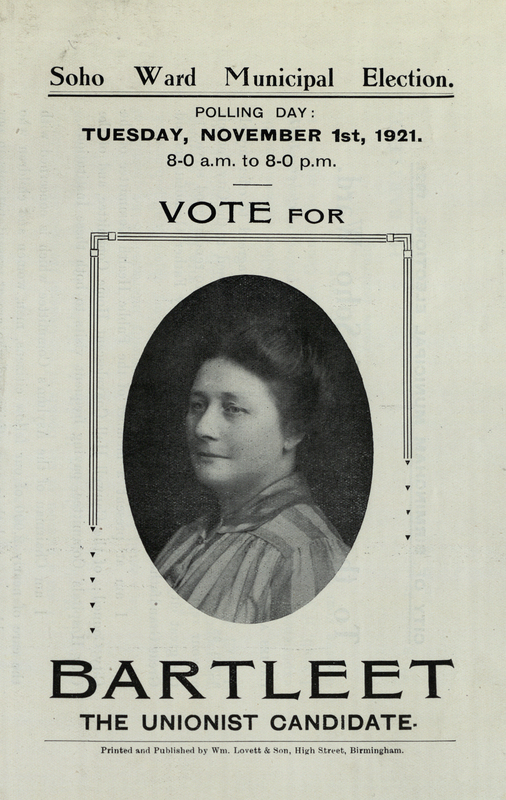 Municipal Election 1920, Selly Oak Ward, Mrs Cottrell, Co-operative and Labour Candidate. As local government dealt with social issues that affected people’s daily lives, standing for election was a natural extension for women who had been involved in local political and social activism. The first woman Labour Councillor, Mary E. Cottrell, who was elected unopposed in Selly Oak in February 1917 had been a long standing activist in the Women’s Co-operative Guild and had formerly stood for election as a Poor Law Guardian. Mary’s election leaflet from 1920 illustrates the breadth of her interests. She advocated a number of policies – change to the rating system, capital expenditure to ease the housing shortage, indoor water supply in more homes, making local hospitals part of ‘an efficient State Health Service’, free secondary education with more schools, playing fields and smaller classes, a ‘good and cheap’ tramway system for the suburbs, more allotments, a municipal milk supply, and City Council labour schemes for the unemployed. She concluded by stressing the need for women councillors. Mary also went on to play a national role. In 1921 she became the first woman to be elected to the board of the Co-operative Wholesale Society and consequently resigned her City Council seat in 1922 due to pressure of work. During the Second World War she was a government advisor on rationing. There was a general perception that women were especially fitted to deal with particular ‘women’s issues’ – education, health, housing, and maternity and child welfare. Henrietta Bartleet was elected to represent the Soho ward in June 1918. Educated at Edgbaston High School for Girls, she was active in the Country Holidays for Town Children Society and had previously been nominated by the Birmingham Women’s Local Government Association as an Independent candidate. In 1920, only two years after her election Henrietta became the first woman to hold a full committee chairmanship when she was elected chair of the Asylums Committee. She was also later chair of the Public Health Committee, and one of the longest serving of the early women councillors spending 26 years on the Council until her death in 1944. Birmingham Municipal Elections Literature, 1920 – 1924. Municipal Election 1921, Soho Ward, Miss Bartleet – Unionist Candidate. In 1921, when Henrietta was seeking re-election as a Unionist, the paper Straight Forward summed up her record over the previous three years. She had, it stated, ‘rendered sterling service in those great fields of municipal administration which are rightly regarded as, in an especial sense, the province of women councillors – Housing, Health and Education.’ In her election leaflet she described herself as a member of the Public Health Committee, the Canwell Hall Convalescent Home Committee, the City Hospitals’ Committee, and the committee dealing with unemployment. She was Chairman of the Asylums Committee; a member of the Boards of the General Hospital, the Children’s Hospital, the Moseley Convalescent Hospital for Children, and a Governor of King Edward’s School. No wonder she concluded that ‘My whole time is given to the service of my fellow citizens’! More women put themselves forward as candidates in the municipal elections of 1919 and the numbers of women on the Council increased slightly. In June 1919 Adelaide Lloyd was elected as a Unionist councillor in Sparkbrook, followed in November by Elizabeth Cadbury (Liberal), Cecilia M. Mitchell (Labour) and Mary L. Wilson (Independent). Despite this they remained a very small minority compared to the men as Adelaide Lloyd pointed out in her 1921 re-election leaflet – ‘It is Important that a great effort should be made to retain this Seat for a Woman. The City Council consists of 120 Members, of whom only 7 are Women.’ She was defeated by the male Labour candidate. Birmingham Municipal Elections Literature, 1920 – 1924. 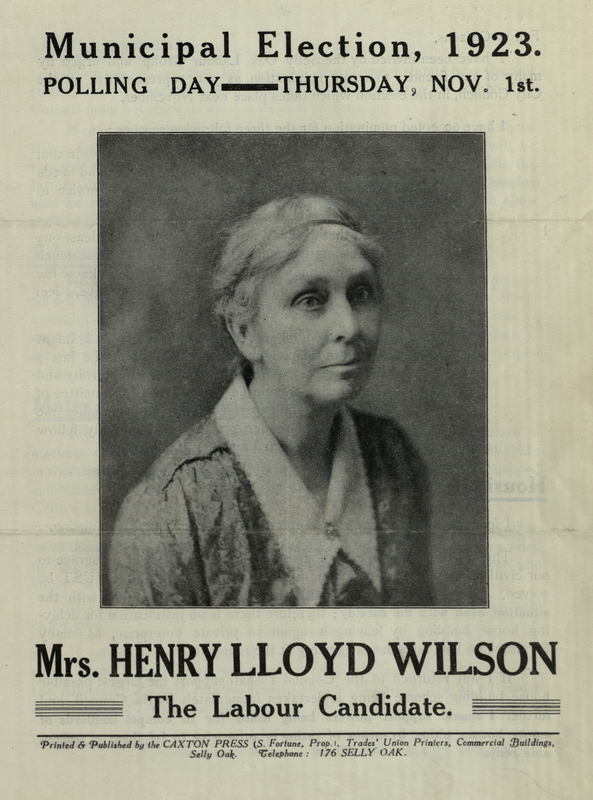 Municipal Election 1923, Selly Oak Ward, Mrs Henry Lloyd Wilson – Labour Candidate. 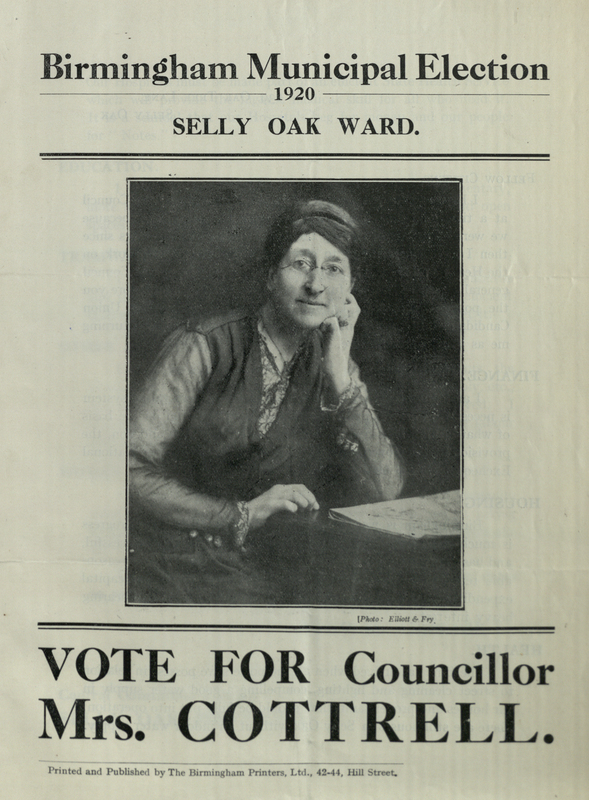 In November 1923 the Labour candidate for Selly Oak, local Quaker and peace activist Theodora Mary Wilson, went further maintaining that at least one out of the three councillors in every ward should be a woman. She reasoned that ‘as I have lived in close touch with my fellow women citizens in this Ward, and know the appalling conditions under which many of them live, I feel that I could represent them on the Council’. Theodora was elected and served as a councillor until 1932. This blog has only scratched the surface, briefly mentioning only a handful of the 24 women who were elected to the City Council between 1911 and 1939, not to mention those who were unsuccessful! Hopefully however it has highlighted the potential of a largely untapped collection to contribute to our scant knowledge of the political activities of Birmingham women in local government in this period. Fancy doing a bit of research…? This entry was posted in Events, Our Collections and tagged Archives, Birmingham, International Women's Day, Politics, Women. Bookmark the permalink. Thankyou! This makes my Selly Oak family his and herstory all the richer because my Grt Gran x 2 got to vote for the first time as a 70 year old and being a home owner in Exeter Rd in 1920. I emigrated to Australia age 14yrs so I didn’t get to learn about local and national political parties. It is fascinating when a middle-class woman becomes a dedicated Labour candidate like Mrs Cotterill so I’d love to find out more about her. The Suffrage movement must have given them a lot of confidence and encouragement to put their extensive experiences into political action. Did they have any particular successes – afterall its the numbers that count. Mrs Wilson voices the terrible living circumstances of some – a family member had heard that an aunt was evicted with children when she was widowed. I haven’t been able to verify this practise, but it would be great to follow up. This kind of research seems rare. Fortunatley the Southall’s occupied houses in same street so close to each other to offer support(which they did in Dudley the previous century as Nailers). I’ve also notice literacy (or being able to sign your name) doesn’t start to change until the generation growing up around this period. The double-edged sword of the world wide web of instant knowledge sharing is a Diversional Stimulus – I started off looking for information on daggers and swords relevant to the character in my novel set during the English Republic, and found myself learning about women in local politics where I grew up in Selly Oak Birmingham! I am going to save this, and come back again another day. I hope I live a long time to write and research these stories of our commoners development.